Sage One Accounting offers quick, easy and secure online invoicing for small and medium sized businesses. As Sage One Accounting software is completely online, it is compatible with Mac, PC and even your tablet. The Sage One mobile app allows you to edit contacts, create and send invoices swiftly on the move. As Sage One is cloud based, you can create and email invoices and credit notes from any PC, tablet or device with an internet connection. To save time you can produce credit notes directly from invoices to instantly email to your customers. By default, all invoices generated in Sage One Accounting meet HMRC requirements for VAT and as the invoicing software is online, you can be assured that it is always up to date with the latest regulations. As you create an invoice select the required tax rate, this will show the VAT breakdown on the invoice and it will then be included in the appropriate VAT return to HMRC. Sage One software makes accounting for VAT easy, saving you time and ensuring you remain compliant. You can link Sage One online invoice software to Google Drive to automatically backup invoices. Once you have integrated your Sage One Accounting with Google Drive, all sales invoices and credit notes are automatically synced with Google Drive. This gives you extra peace of mind and added flexibility to work on any device and to easily share files with colleagues. Sage One Accounting online invoice software produces personalised, professional and functional invoices to send directly to your customers. With built-in invoice templates that can be easily customised with your company’s branding; you can personalise your invoices by choosing from several templates, adding your logo and your business terms and conditions for invoice payment. You will then be ready to email your invoices to your customers or export to PDF for printing. Easily create product or service invoices. Set up lists of your products or services for quick invoicing. Add new products from the invoicing screen or write custom invoice descriptions as you go. 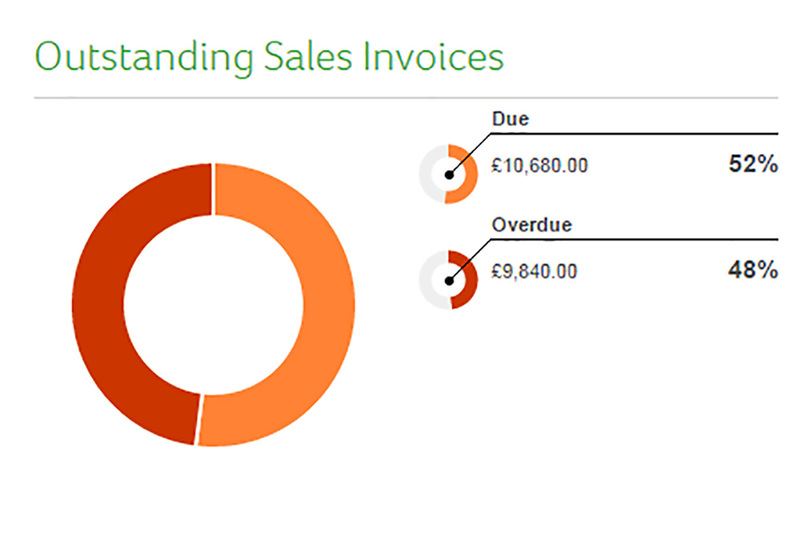 Record payments against invoices and manage overdue invoices using the sales dashboard. Set credit terms as you create invoices and analyse overdue items as they occur. Sage One also provides full reporting on all your paid/ unpaid invoices that allows you to become your own credit control. Create your first invoice in Sage One in just two minutes. Sign up for your free trial and get started. As you’re invoicing your customers online, why not give them the opportunity to pay their invoice online as well? Get paid faster by integrating your online invoice software with Sage Pay. You can take payment directly from your invoices by adding a ‘Pay Now’ button onto the invoices before emailing them to your customers. This will encourage your customers to pay you promptly and you won’t have to chase payment at the end of every month. Sage One accounting software helps you keep on top of your invoicing and this means you can get paid faster. Produce sales quotes and quickly convert into invoices once the job is won, or flag as declined if the job does not turn into an order. You can also use the same custom template that you use for your invoices. The Sage One reporting feature allows you to track quotes won or lost. Sage One Accounting allows you to post transactions in any currency. Expand your market by enabling foreign currencies and invoice customers in US Dollar, Euro or any currency required. Enter an exchange rate on the invoice and on payment and Sage One will account for the gain or loss on exchange. Sage One is an online invoice software package that makes it as quick and easy to account for international sales as it is for sales to your local customers.